As this is my last Thanksgiving while serving as president of Goodwill in central Indiana, I am a bit more reflective than I usually am in the early days of what is typically the busiest time of year for me. And when I start thinking of all of the reasons I have to be thankful, the list just keeps growing. Of course, all of us at Goodwill are grateful for the hundreds of thousands of people who donate goods, shop in our stores, give money, or hire our graduates. We’re grateful for those in many other organizations and units of government who work with us to make opportunities available to thousands of people who haven’t had a lot of opportunities. We’re grateful for the good business relationships we have with companies and other entities that enable us to provide jobs for people with significant disabilities or other barriers that limit their options. We’re also grateful for those who take advantage of the opportunities we can offer – individuals who put forth much effort – sometimes overcoming major obstacles in the process – to improve their lives and the lives of their families. I’m particularly grateful for our 3100 employees who do their work so well day in and day out and who work well with each other to help our organization have significant impact. And I’m grateful for the leadership, guidance, and support we have received over the years from boards of directors that have given us the freedom to try many different ways of growing our businesses and accomplishing our mission. And I’m especially grateful that those boards have also given us the freedom to fail at some of what we try and learn and grow from the experiences. And, of course, it was a board of directors who took a chance and gave me the opportunity to be CEO of this organization when I was only 30 years old and had only three years experience in a management role. I’m grateful to them not only for that opportunity, but also for being patient with me as I made many mistakes trying to learn how to do my job reasonably well – most of the time, at least. And now, after 40 years, I find myself even more grateful to have been in a position where I can honestly say I cannot recall a day in my entire career when I woke up in the morning wishing I didn’t have to go to work. Of course, I have much more to be thankful for. I’m thankful for good health, friends, and family. I’m particularly thankful for my wife, who’s put up with me for nearly 35 years and willingly done so many things that have made my life easier and much more pleasant than it would have been otherwise. And I’m thankful for our two grown children, who are good citizens engaged in vocations where they work directly with many people who haven’t been dealt a good hand in life. And on Thanksgiving Day and the upcoming Christmas and New Year’s holidays, I’ll also be grateful for the wonderful desserts and other foods I seldom let my disgustingly disciplined self enjoy at other times of the year. 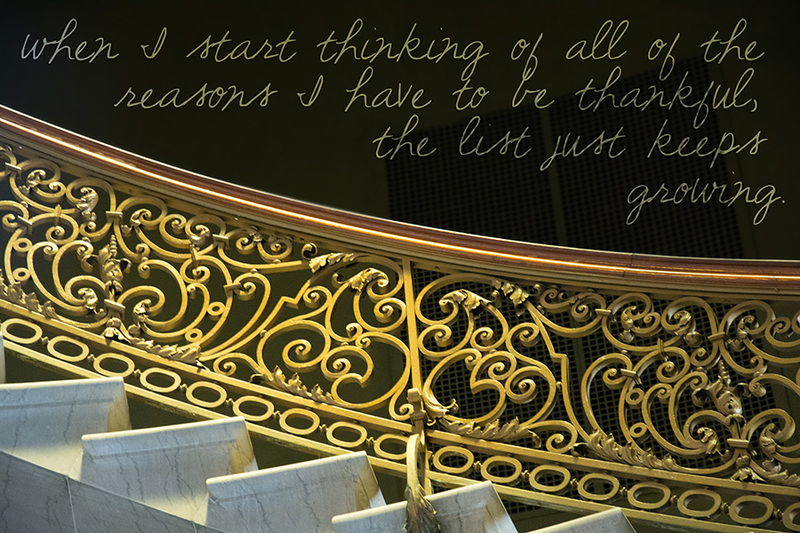 If I keep thinking about it, I’ll add more to my list of reasons to be thankful. But you get the idea. And if you haven’t already made your own list, I recommend you do so. It’s a good way to help bring a bit of perspective as we deal with the problems and hassles we frequently encounter in our day-to-day lives. It’s not unusual to hear someone speak of America as a land of second chances. In this country, most people tend to be reasonably forgiving and willing to give a person another chance – most of the time and within limits, at least. Neither is it unusual for me to hear people at Goodwill talk about how we or someone in our organization gave them a second chance. I frequently hear this from students in our Excel Centers. Our students are older youth and adults who, for any of a variety of reasons, had dropped out of school. While many of them later wanted to complete the work required for a diploma, the options available to them just didn’t fit their life circumstances. Since we opened the first Excel Center, the demand for space in these unique high schools has been phenomenal. From 300 students in one location just three years ago, we now have nearly 3,000 students in nine central Indiana locations. All of our students have enrolled voluntarily, and most are grateful to have another chance to complete what they didn’t finish the first time around. Better yet, their opportunities don’t end when they receive their diploma. If they have the desire and are willing to put forth the necessary effort, Goodwill will continue to work with them until they attain a post-secondary credential, become employed, and remain in the workforce for at least a year. There’s another group at Goodwill that is benefiting from a second chance. Over 300 of our employees have criminal records, and many of them have had a very hard time finding an employer who would give them an opportunity to start life anew. Does it always work out? Of course not. But most of the time, it does. The benefits – to the individuals who have been given a second chance and to our society at large – are huge. Throughout its history, Goodwill has employed a lot of people few others seemed willing to hire – whether because of a disability, a criminal history, a low education level, or some other barrier. In many cases, rather than a second chance, Goodwill has given them a first chance to become productive, contributing citizens. There are limits, of course. While we are happy to work with those who put forth their best effort and try to do a good job, those who make it difficult or impossible for us to trust them will seldom find another opportunity in our organization. Neither will those who demonstrate a pattern of treating others poorly. On the other hand, employees who demonstrate good work habits and a good attitude, consistently treat others with respect, have a genuine desire to improve their education and skill levels, and are willing to put forth the necessary effort to do so may qualify for assistance from Goodwill that can lead to better career opportunities with us or with another employer. The options available through Goodwill or other entities with which we have strong relationships are greater than ever. One of Goodwill’s historic values is that we provide opportunities, not charity, and foster development, not dependency. That value is just as strong today as it was when Goodwill was founded in the early years of the 20th century – whether it’s a first, second, or maybe even a third chance. 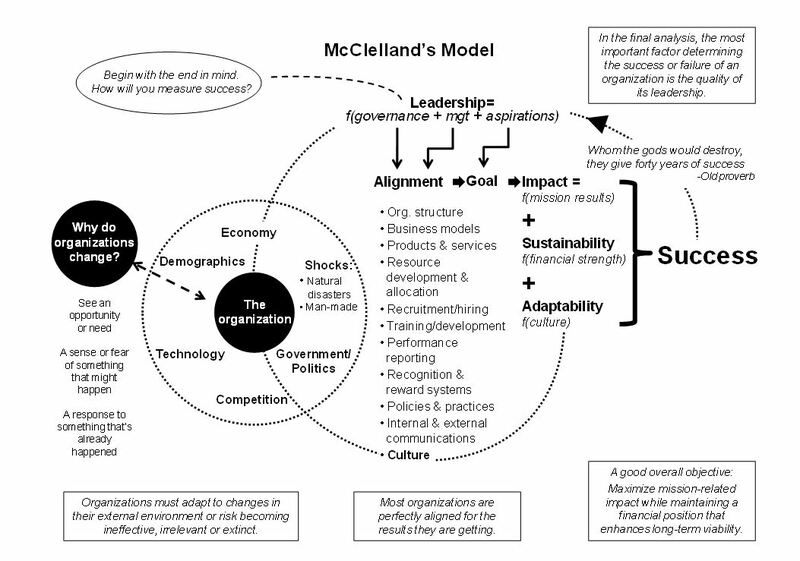 Forty years after starting my Goodwill career, I attempted to summarize on one chart the essence of what I have learned about the ingredients necessary to sustain organizational success over a long period of time. Here’s a brief explanation of what appears at the end of this post. Every organization exists in a larger context and is affected by many external factors, including changes in the economy, demographics, technology, competition, laws or regulations, the political climate, and external shocks, which can be natural or man-made disasters. Organizations must be able to adapt quickly and effectively to such changes or risk becoming ineffective, irrelevant, or extinct. It can be useful to keep in mind that organizations change for three reasons: They see a need or an opportunity; they have a sense or fear of something that might happen; or they change in response to something that’s already happened. Organizational leadership in the not-for-profit sector is a function of three components: governance, management, and aspirations (or vision). The organization’s leaders should begin with the end in mind, i.e. by asking how they will measure success. They should translate the aspirations into concrete, measurable goals and align everything toward the goals, including organizational structure, business models, products and services, resource development and allocation, recruitment and hiring, training and development, performance reporting, recognition and reward systems, policies and practices, internal and external communication, and organizational culture. The leaders should be aware that most organizations are perfectly aligned for the results they are getting, and if any major factor is significantly out of alignment, it will be nearly impossible for the organization to excel. The leaders must also recognize that none of the above is static. Everything is subject to change as new opportunities or challenges arise and as the external environment changes. Success is a function of three elements: (1) impact, which is a function of mission-related results, (2) sustainability, which is a function of financial strength, and (3) adaptability, which is a function of the organization’s culture. An organization can be successful for a time with just the first two, but it will cease being so if its culture does not enable it to adapt effectively as the world in which it operates changes. A good overall objective for a not-for-profit organization is to maximize mission-related impact while maintaining a financial position that enhances long term viability. The leaders of a successful organization must constantly be aware that sustained success can result in succumbing to the demons of inertia, complacency, myopia, or arrogance. They must remind themselves of the old proverb, “Whom the gods would destroy they give forty years of success.” Today, though, it doesn’t take anywhere near forty years for any of those demons to cause an organization to be destroyed by outside forces or to self-destruct. During my career, which now spans four decades, there have been leaders from both major political parties at various times at local, state, and national levels. We’ve worked well with both Democratic and Republican administrations. • Every individual has value, and we strive to treat everyone in a respectful manner. • Work adds meaning and purpose to life. • Goodwill offers opportunities, not charity, and fosters development, not dependency. Opportunities we offer include employment for people who have had limited options because of a disability or other barrier. We also offer opportunities through our Excel Centers for adults who want to earn a high school diploma and begin work on a post-secondary credential that will enhance their employment options. During the recession of the early 1980’s, we concluded that nothing would help our organization or the people we assist more than a strong, growing economy. That continues to be the case. Also, it seems to us that the better we develop the potential of our people – especially by increasing education attainment levels – and provide conditions that enable people to productively use their talents, the stronger the economy is likely to be. As our organization has evolved, on numerous occasions we’ve redeployed resources from efforts that were marginally effective to initiatives that showed more promise. Over time, this shifting of resources, combined with a substantial increase in our pool of talented people – our human capital – has enabled the organization overall to grow not only in size, but in long term impact. Unfortunately, over the last forty years, we’ve seen in our society negative trends in a lot of social indicators, including poverty rates, education attainment levels, incarceration rates, and a lot of health-related issues, despite a lot of well-intentioned programs that have cost enormous amounts of money (see my July 6, 2011 post). Fortunately, there have also been a few programs that randomized controlled trials have shown to be highly effective in preventing problems and developing potential. One of those is Nurse-Family Partnership, which Goodwill is implementing in Indianapolis. In the face of massive federal deficits, it would seem reasonable to reduce or eliminate funding for programs with marginal effectiveness and increase support for evidence-based programs that produce significant long term impact. The future economic and social benefits could be enormous. Reasonable people can and will disagree over many things, including how best to reduce social problems and generate a higher rate of growth in the economy. However, in the face of such disagreements, reasonable people must try to find common ground and not allow their view of the perfect to be the enemy of the good. My hope is that enough of our elected leaders in both major political parties would resolve to overcome and move beyond a toxic political atmosphere and resulting gridlock that have been preventing steps that might lead to a stronger, healthier, more civil and economically vibrant society that would benefit all citizens, including those we assist at Goodwill. Not surprisingly, the bigger the organization, the harder it is and the more time it takes to change a culture. Of course, if the leader of a unit has too many limitations on his/her ability to hire and fire, change the reward system, or allocate resources, significant culture change within that unit can be nearly impossible. I think about this from time to time in relation to the culture of our society. To what extent do similar factors apply? Certainly, the way we educate and train (i.e. develop) people is hugely important. The kind of performance and behaviors we reward or punish also heavily influence a society’s culture. How a society chooses to allocate resources also has a bearing on culture. For example, using resources to help people develop and productively utilize their talents will tend to create and reinforce a very different kind of culture than if we use resources largely in ways that reinforce dependencies. How leaders act can also be a major factor. Unfortunately, we live in an era when respect for institutions of all kinds is at perhaps an all time low. While at times there are good reasons for lack of respect for an organization, other organizations in the same field that have not acted improperly are often tarnished by association. Consequently, even those leaders of institutions who demonstrate admirable behavior and performance often have few followers outside the institutions they lead. If we use a basic definition of a leader as one who has followers, it seems that a lot of celebrities have far more followers than do most leaders of business, governmental, religious, or not-for-profit organizations. Often, those celebrities and , seemingly, all of their actions – especially the less admirable ones – are widely publicized by various media. We can at least be grateful for those celebrities who consistently demonstrate attributes that are worth emulating. For those of us in positions of influence in an organization, it’s obviously important that we do all we can to cultivate a culture that optimizes the potential for success of the organization and its people. Part of that involves reminding ourselves that, whether we like it or not, others are watching what we do and how we act in various situations. All of us need to do our best to conduct ourselves in ways that are worth emulating and that will enhance rather than detract from, not only the kind of organization we want, but also the kind of society we want for our children and grandchildren.